* Get down on the farm with the Britains Big Farm John Deere 6830S tractor with its detachable front loader that rises, drops and pivots. * There's a detachable cab, the bonnet opens to reveal superb engine detail. * The tractor features detachable dual rear wheels, height adjustable rear hitch, working lights, plus realistic engine and reversing sounds. 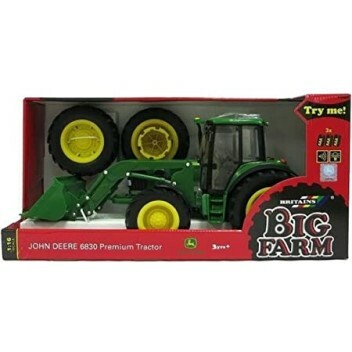 * Compatible with all Britains Big Farm toys and other 1:16 scale authentic replica plastic farm pieces. * Suitable for indoor and outdoor play. * 3 x AAA batteries included.